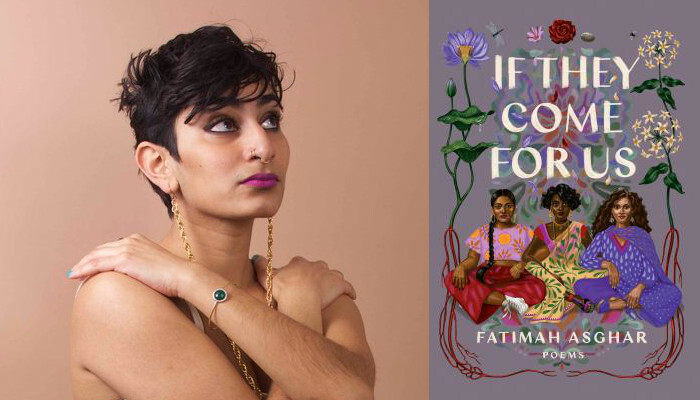 Poet Fatimah Asghar has written a substantial amount of striking and intimate work in her debut collection If They Come for Us. In this collection, Asghar digs into themes of national and personal identity, chronicling her development as a young immigrant into her teens and young adulthood in America. She relates a dissonance in her identity, the struggle to “Map Home” as she balances her people's history with her developing identity in America. She is intimate with her self, revealing an acute awareness of her own body, her sexuality, and that unique convergence with her religion and family culture. She details her experiences with racism against her Muslim identity, narrations during 9/11, and the lifelong difficulties she faces as one orphaned as a child. Poems like “Kal” and “Portrait of my Father, Alive” let us glimpse the inherent ache that comes from losing parents at a young age. An excerpt from “Kal” reads, “Kal. / A spell cast with the entire / mouth. Back of the throat / to teeth. Tomorrow means I might / have her forever. Yesterday means / I say goodbye, again. / Kal means they are the same.” Throughout, she handles her heartbreaks with tenderness and her victorious moments with vivacity. Asghar begins her collection by addressing the devastating partition that divided the Indian and Pakistani people in 1947. Several poems in the collection are titled “Partition”, each one detailing certain aspects of the event as she connects to and empathizes with the past violence inflicted on her people. For instance, in the first poem titled “Partition”, she groups together difficult scenes of violence, each vignette dated from the 1940s all the way to contemporary times. In the theme of political oppression, Asghar launches a fiery arrow against the current Trump presidency in light of his values and of the particular decision that banned Muslim immigration for a time, referenced in the poem titled “100 Words on 45’s 100 Days”. As to her form, she experiments with visual patterns, film directions, organizational columns, crossword puzzles, floorplans, and more. One poem titled “Microaggression Bingo” displays her humor and directs a scathing, critical eye towards those who marginalize others with their remarks. Meanwhile, other poems welcome the reader into her childhood, displaying confidential scenes with her sisters, strained family dynamic, and personal sexual development. The whole collection features poems that are simultaneously sensitive and dynamic, creating a cohesive work that explores identity and the struggle to map out what home looks and feels as she reconciles the struggles between her two home countries. Her strong voice reverberates in this nuanced collection, making for a beautiful debut.